Gaming companies are using social media to promote and to expand their businesses in China, just like any other organization is doing everywhere nowadays. Are they doing a good job? Let’s have a look. However there are something missing. 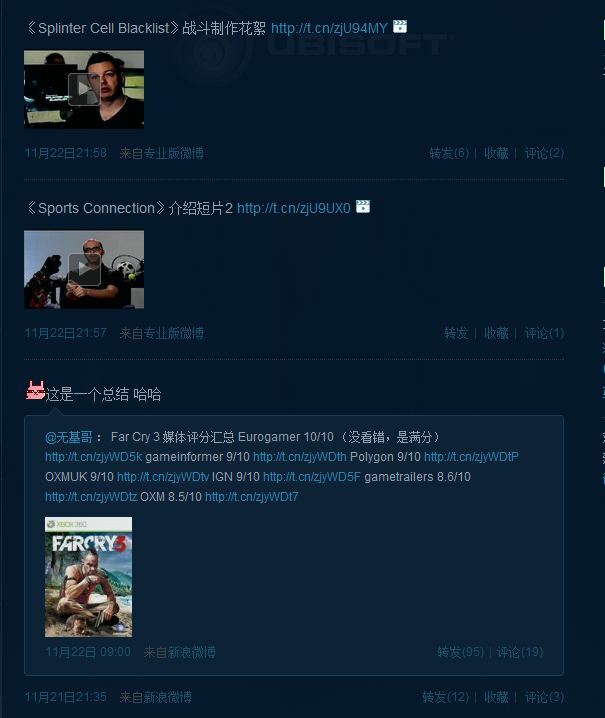 Yes, there are tweets about Ubisoft’s latest games (mostly videos), but only a few of them matters to the gamers in China since most of the videos are about games that have the slightest chances of getting in China, and the number of retweets of these contents proved my point. What should be done is to have more relative contents for the followers. To start, Ubisoft China can have more information put out for the new Assassin’s Creed game, which is set to release in China. Furthermore, they can have more information for the followers regarding their social games, given that it constitutes a large portion of immediate profit in China. 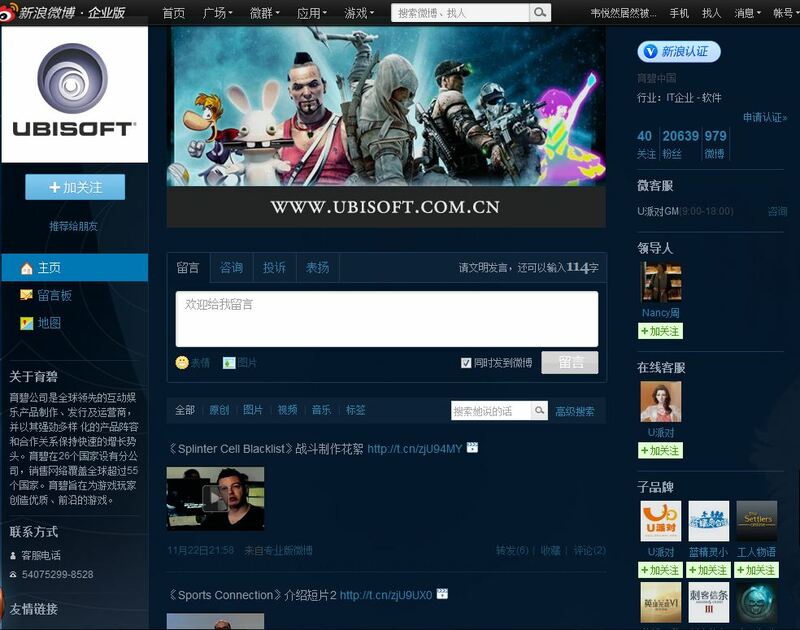 Ubisoft China’s Message Board,as you can see that none of the latest messages was responded. 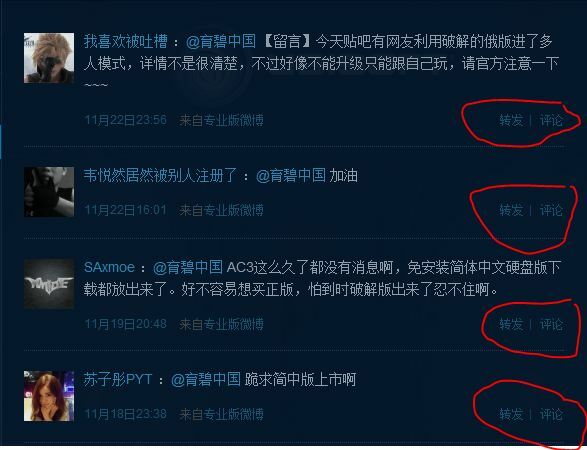 The One of the business advantage of weibo.com compared to twitter is the message board. Instead of interacting with the followers with tweets, the message board offers a more direct and instant interaction. However, Ubisoft China did not do a good job on that. Just take a look at how many follower messages were replied by the account. None. How would you get people to interact with you if you don’t reach out to them? where would they find motivations to engage with you if you don’t let their voice be heard? Of course the followers are not expecting you to reply every single message posted on your message board, but your gesture of taking care of your followers’ concerns will be appreciated.